This article first appeared in the Rushville Republican on June 27, 2017. It’s once again time for the Rush County Fair and the Rush Memorial Hospital Foundation is geared up for a great week. 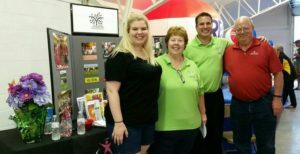 Fair week is traditionally the time to reconnect with friends and family, make new friends, and see the richness of Rush County agriculture, business, 4-H, and race track teamwork. It is an annual tradition that everyone looks forward to each summer. The RMH Foundation is excited to share in this tradition. The RMH Foundation will have a booth located inside the RushShelby Energy Community Building. Visitors can stop by to share in pictures of events and projects of the past year. RMH Foundation staff and Foundation Board members will greet you and be happy to answer questions concerning the RMH Foundation and Rush Memorial Hospital. Information is available on each fund and the upcoming RMH Golf Outing (July 21) and Brian’s Cause (Oct. 14). Of course there will be giveaways too. What’s a fair booth without giveaways. In 2005, the RMH Foundation was created and since its inception over $2 million have been given to Rush Memorial Hospital for adding, updating, renovating services, and patient programs within the hospital. Some examples include: the Medical Office Building, RMH Pediatric Office Building, Digital Mammography Suite, Chapel renovation, and new equipment in several hospital departments. All of these were brought about through generous donations, small or large, of wonderful patrons that support Rush Memorial Hospital. The RMH Foundation’s Seed Circle was created to bring together women that were interested in learning more about Rush Memorial, the RMH Foundation, and support both through volunteerism. New this past year is the creation of the Seeds of Care program where grateful patients and/or their families can honor an RMH employee or department with a gift to the RMH Foundation. The first Seeds of Care presentation will be taking place very soon. There is much happening within the RMH Foundation. So take a little time and stop by the RMH Foundation booth at the Rush County Fair this week. The staff and RMHF Board look forward to seeing you! For additional information about the RMH Foundation call 765-932-7568 or stop by the Rush Memorial Hospital Foundation Office at 1231 North Main Street, Rushville. See you at the fair.